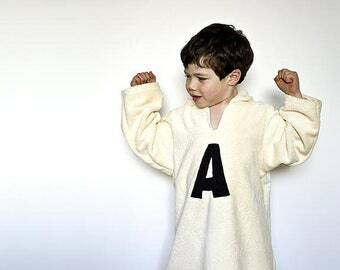 Child gift, organic robe for boy or gir. Warm bath robe in organic fabric. Ecofriendly toddler robe with brown owl. This Organic Children Robe has been designed to be pulled over the heard. No button no belt, just one piece so that your kids will stay warm and toasty. This cozy bathrobe is made from some thick GOTS certified ORGANIC cotton (Ecocert certified). Decoration is made with ORGANIC cotton without the help of any scratchy synthetic backing. All seams are serged with soft cotton thread for even more softness. Just specify sizing preference in your "message from buyer" when purchasing. You can choose from different colors: chocolate brown, hot pink or lime green. Bath robe in organic cotton. Toddler gift. Child housecoat with whale. Natural eco hooded robe for kids. Girl's hooded bath robe with little fairy from GOTS Certified organic cotton. Waldorf inspired robe for ecofriendly girls. Personalized robe with monogram with hood in organic cotton. Eco friendly bath cape in ivory color. Children gift with monogram. Lime green velour fabric in organic cotton. Solid green velour fabric by 1/2 the meter (50 cm). Waldorf inspired fabric in red and green magical garden. Certified organic Cotton by 1/2 meter or yard. 6 bib kit from organic cotton for boys. Set of organic fabric for 6 DIY bandana bibs. DIY baby shower gift. Lavender velour fabric in organic cotton. Organic velvet fabric in mauve by the 1/2 meter (50 cm). Hooded towel for organic baby in lime green and chocolate brown. Organic cotton towel set with owl pattern. Baby bath wrap in red with flowers, birds and butterflies. Square hooded towel set with wash mits in organic fabric. Baby gift.